During my pregnancy, I worked up until the very last minute. Literally. My water broke at 38 weeks, 6 days while in a patient’s room! 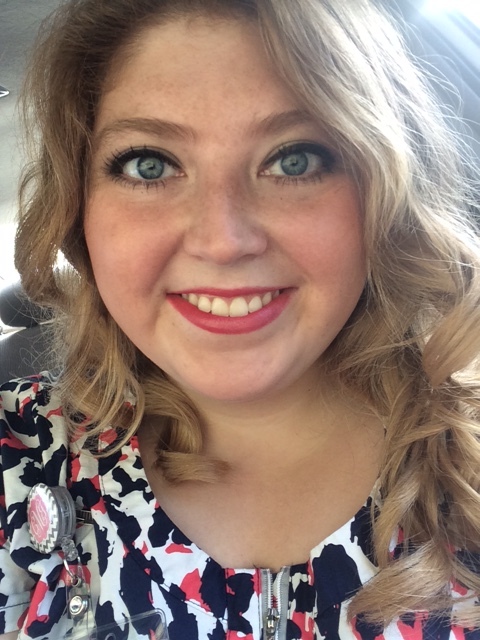 The shift before my water broke, I was performing CPR in order to save a patient’s life! It was exhausting, both mentally and physically, but I feel like I had a healthier pregnancy because I continued to work. Of course, it’s always best to consult with your doctor before following any advice because each and every pregnancy is unique! This post contains affiliate links, which means that if you click on one of the product links, I may receive a small commission. But I’ll always give you honest reviews on products that I’ve tried. Pinky swear. 1 – Rest on your days off. Pregnancy makes you so exhausted and nursing is a physically demanding job. Don’t worry about a clean house and get some extra rest! I used my days off to lay around the house, and once at 37 weeks, spent the evening floating in the lazy river at a nearby water park! Seriously, your body needs to recover from working long hours with the extra weight of your baby, placenta, and all those fluids that keep your little one healthy in utero. If you’re determined to work until the end of your pregnancy, take advantage of those glorious off days to rest and relax! 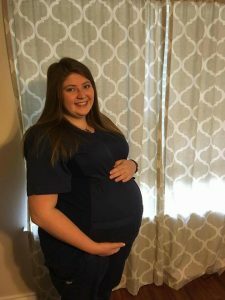 2 – Don’t wait to get maternity scrubs. When I was pregnant I put off buying maternity scrubs because I felt they were an unnecessary expense until I was popping out of my regular scrub tops. So instead, I waddled around the hospital with my bump busting at the seams of my scrubs. 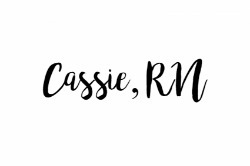 When I made the switch to maternity scrubs, I was so much more comfortable! It even made doing my job easier. The expense of maternity scrubs was definitely worth the extra space for my growing belly. I felt like I could bend, breathe, and stretch so much better in my new scrubs. I really loved this maternity scrub set . The bow around the top of the bump was so cute to accentuate my changing belly! I also bought an extra pair of scrub pants so that I always had comfortable pants clean for work. Trust me on this, the sooner you switch, the more comfortable you’ll feel. Maternity pants are the best! 3 – Wear compression socks! My feet and legs would ache after a 12 hour shift! I remember getting in the car after working all night and feeling like my toes were throbbing. At the end of my pregnancy, my feet also became very swollen. Compression socks made a huge difference with the swelling and gave my tired feet some relief after long shifts. My sweet husband bought me these compression socks as a Mother’s Day present. They are a little expensive, but I plan on wearing them when I return to work after maternity leave to prevent varicose veins and protect my feet, so I think they’re worth it! 4 – Tell a coworker you trust. Before you feel like the time is right to formally announce your pregnancy to your supervisor or manager, consider telling a trusted coworker. That way if there is an emergency, someone is aware of your situation. One of the charge nurses that I work with realized I was pregnant even before I had told my parents! I was a little self conscious that she had found out so early in our pregnancy, especially because she found out when I became really nauseous at the nurse’s station. Looking back though, I’m glad she knew so early. If I had become injured or ill while at work, someone knew that I was carrying our baby and would be able to advocate for me if I was in a position where I couldn’t advocate for myself. 5 – Ask for help. Nursing can be a physically demanding job! Nurses who aren’t pregnant should ask for help lifting and moving patients, but you should be especially careful to request help with heavy lifting while you’re pregnant. You definitely don’t want to injure yourself or put your baby at harm. 6 – Bring extra snacks. I was so hungry throughout my pregnancy! It always seemed like I would be especially hungry in the middle of the night while documenting my patient assessments. There is always the temptation of splurging on something from the vending machine, but those salty snacks aren’t great for pregnancy because of the risks of high blood pressure and gestational diabetes. I highly recommend bringing a variety and an abundance of foods from home. This will save you money and be much healthier for your pregnancy. 7 – Avoid contagious illnesses and avoid administering unsafe drugs. This one is a little harder, but some patient illnesses aren’t safe for pregnant moms to care for. Shingles is a big one, as well as patients who are receiving radiation treatment. Some drugs are unsafe for pregnant women to handle, so be careful around those as well. I know Coumadin is one drug to be cautious with, as well as chemotherapy drugs. Like always, talk with your doctor about their specific concerns, what to avoid, and your pregnancy. 8 – Stay in close touch with your doctor. My doctor knew I was a nurse and the demands that my body was going through at work during our pregnancy. Her and her staff were phenomenal about answering my questions and addressing my concerns, especially at the end of our pregnancy. Congratulations and good luck, Nurse Mama! Take care of yourself while you’re taking care of others! Just before my very last shift, 38 weeks, 6 days. 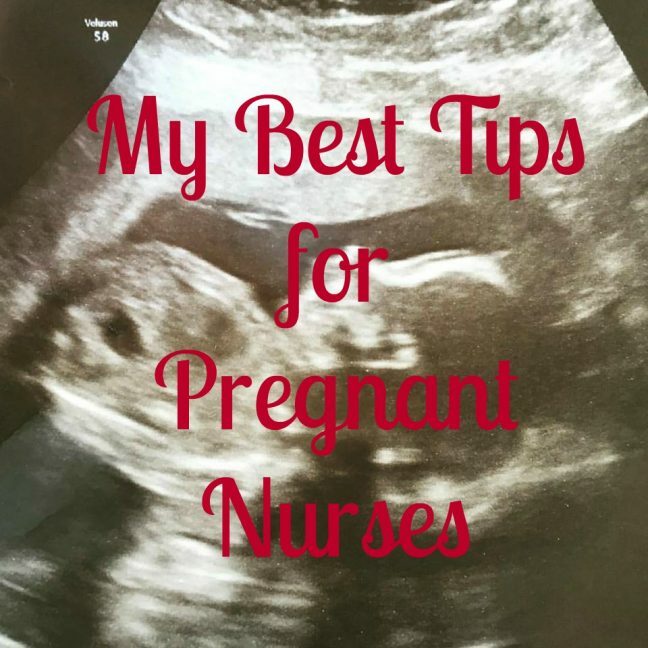 What advice would you share with pregnant nurses?